My name is Tim Hudson and I have over 25 years experience fishing for Striped Bass (Stripers) and Hybrid Striped Bass (Wipers). I have also fished for Salmon and Skamania Steelhead on Lake Michigan for many years. Thus the name of my boat, Skamaniac. I have been an avid outdoorsman all my life and love to fish and hunt. My love for fishing has led me to become a fishing guide so I can share my knowledge and experience and give my clients the best chance to catch trophy fish right here in Indiana. Nothing thrills me more than to see one of my clients hook up with the biggest fish they have ever caught in their life! I especially enjoy seeing younger fishermen catch their first big fish! I will always go the extra mile to make sure my clients have the best possible fishing experience. 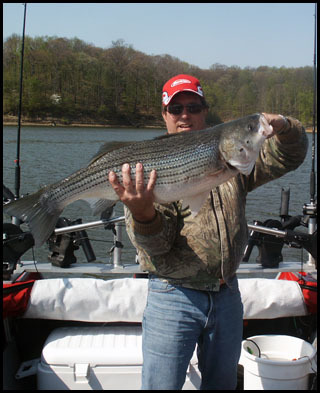 If you have never fished for Stripers or Wipers, you are in for the experience of a lifetime! © 2019 Skamaniac Charters. All Rights Reserved.